November 7th, 2017, Charlottetown – Island speed skaters made strong showings at events on both sides of the country over the weekend. At the Olympic Oval in Calgary, Charlottetown native Andrew McQuaid clocked a new personal best in the 1000 metre distance while competing in the Canadian Open National qualifier event. McQuaid was P.E.I.’s lone representative in the elite level national event. He placed 52nd overall, with his best placement , 41st, coming in the 500 metre distance. McQuaid notched a 500m time of 44.371 seconds, just eight 1/1000ths shy of his personal best time from earlier this fall. McQuaid’s new personal best mark in the 1000m distance was 1:32.892. Jane Bruce of Stratford won a gold medal for P.E.I. at the recent Harold Joyce Championship speed skating competition in Fredericton, N.B.. Photo courtesy of Kristen Binns Photography. Meanwhile, in Fredericton, N.B., P.E.I.’s team of twelve skaters grabbed three medals at the Harold Joyce Championship short track event. Jane Bruce of Stratford nabbed the lone gold medal for the Island team, skating in division 8. Bruce recorded new personal best times in all four of her events, to earn her second medal of the new season, following a silver in Halifax last month. Anderson Arseneau brought home a silver medal for P.E.I. with a weekend of consistent strong racing in division 5, including a new personal best in the 200m sprint event. William Lyons of Rock Barra earned a bronze medal in division 1 for the Island squad, posting the fastest times among all Island skaters, including new personal bests in both the 500m and 1500m distances. Tyler Magee of Hampton, N.B. and Anthony Cormier-Losier of the host Fredericton club placed first and second overall, respectively. Top female honours at the competition went to Angela Xu of the St. Croix Blades, followed by AbbyGail Jackson of Fredericton and Anny Kang of Saint John. P.E.I.’s team again showed plenty of depth in the top division, with five of the top eight spots going to Island skaters, who were among the sixteen division 1 athletes. Also competing for P.E.I. in Fredericton were Thomas McQuaid, Matt Kozma, Rob Binns, Matthew McKenna, Carter Bruce, Liam Chatfield, Addison Bruce, Alex Rogers and Zachary Chatfield. The Fredericton meet featured 140 skaters from eleven clubs across the Maritimes and Nunavut. The Atlantic Cup Speed Skating Championships in Charlottetown on November 25th and 26th will be the next competition on the Maritime circuit. P.E.I. organizers are expecting the Atlantic Cup to draw speed skaters from Ontario, the United States and all four Atlantic provinces. A trio of the Island’s fastest skaters will be in action in Lévis, Q.C. this coming weekend, as Peter McQuaid, Kyle Connell and Andrew Binns take to the ice for a Quebec Provincial circuit competition. 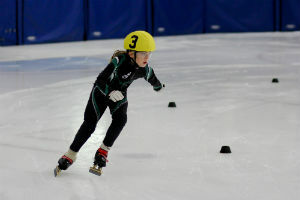 For more information about competitions and Speed Skate PEI programs, visit www.speedskatepei.com.